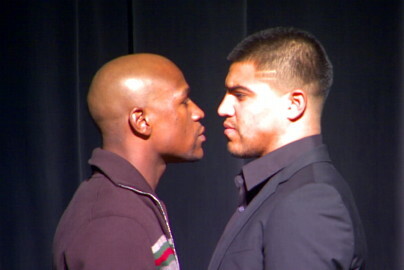 By Chris Williams: Unbeaten Floyd Mayweather Jr. got in a shot at his pursuers Amir Khan and Manny Pacquiao at the same time, saying this about his September 17th opponent WBC welterweight champion Victor Ortiz “He’s the best out there,” according to ESPN. How true. I rate Ortiz as a better fighter than both Khan and Pacquiao, and the reason I do is because he’s bigger, more rugged, nearly as fast and with better power. Mayweather has chosen wisely in taking on the young 24-year-old Ortiz, because it’s an easier fight to put together, Mayweather can get a bigger purse split and there’s none of the hassle about the Olympic style blood testing. Khan will likely be on board with the tests by the USADA, but Pacquiao’s promoter Bob Arum is saying that he wants the WADA to test Pacquiao while he’s training in the Philippines. That obviously isn’t going to work for putting a fight together with Mayweather. But the most important thing is that Mayeather is choosing the best guy out there in selecting Ortiz. He may not be as popular as Pacquiao, but that doesn’t matter because I do agree with Mayweather that he’s better than anyone else he could pick. If you match Ortiz up with any of Pacquiao’s previous opponents in the last three years, I see Ortiz beating them all. The same goes for Khan. Ortiz may have lost to Marcos Maidana by a stoppage defeat in 2009, but that was when Ortiz was only 22, and fighting at 140, which was too low for him. He’s bigger, stronger, older and wiser now. I think he licks Maidana now if the fight were made. I’d like to see Ortiz face Maidana, Miguel Cotto, and Antonio Margarito in the future. I don’t think he’ll ever get a shot at Cotto and Margarito, though, because they fight for Top Rank, and it’s doubtful that their promoter Bob Arum would want Ortiz destroying his fighters. « Does Morales have enough left to beat Matthysse without controversy?